Haitian gang members in Little Haiti, Vice City. The Haitians are a street gang from Grand Theft Auto: Vice City. They are the main rivals of the Cubans/Los Cabrones, and they vie for control of the poorer neighbourhoods of Vice City (Little Haiti and Little Havana). Haitian gang members are seen wearing either blue shirts (reading RELAX), white pants and baseball caps, or sky blue sleeveless shirts, jeans and blue bandanas. After the mission Trojan Voodoo, the Haitians will attack you whenever they spot you in their territory (Little Haiti). Some members will appear with pistols, but most are unarmed, using their fists when fighting. The Haitians congregate and move groups. They usually do not patrol the streets separately. Until the mission Trojan Voodoo is completed, the Haitians are not ordinarily hostile to Tommy, and will only attack in self-defense; Haitian members will also attack the player if they hijack an occupied Voodoo. After the completion of Trojan Voodoo, the Haitians will become hostile to Tommy and will shoot him on sight, regardless of what he is wearing, what car he is driving and whether he is armed or not. Therefore, it is best to complete the Firefighter, Vigilante, Taxi Driver, Pizza Boy and Paramedic missions before completing Trojan Voodoo, or, if the mission has already been completed, it is best to complete the mentioned missions in Vice City Beach. Haitians may attack or be attacked by the Vercetti Gang if they are seen entering or walking near the Kaufman Cabs depot or the Print Works. Likewise, Cubans will shoot and kill Haitians seen in Little Havana or near the Print Works (only before Trojan Voodoo). Also, Haitians will shoot and kill Bikers traveling through Little Haiti from Downtown, and will attack or be attacked by PIGs on the Links Bridge. The Haitians are frequently in conflict with the Cubans gang over turf and the Vercetti Gang over control of their assets; police act against both parties when gun battles occur. In addition, policemen will pursue and kill Haitians members in the same manner as they do with gang members and street criminals, allowing the player to attain "Good Citizen Bonuses" worth $50 each for each punch/kick/attack delivered to a fleeing Haitian member. Player must be careful though, as the Haitian (or any nearby Haitians) may attack player with a pistol. Also, accidentally hitting the cop will give the player a one star wanted level, killing the cop will give the player two. The third version of GTA Vice City had all references to the Haitian people removed, (along with a number of other trademarks), in response to Cuban and Haitian groups in the United States, who threatened to use action against Rockstar Games, on the basis that they were being discriminated against. 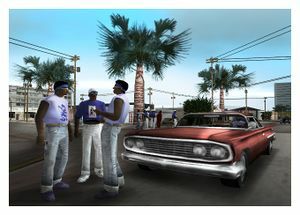 A Haitian organization in the US against racial opression was highly offended by the comments used in the game, such as when Vercetti is ordered to "shoot the Haitian dickheads". Because of this, the word 'Haitian' was taken out of the game's subtitles and they were simply referred to as 'Gangsters'. A pre-release screenshot of some Haitian gang members. In The Well Stacked Pizza Co. branch in Little Haiti, there is a Haitian gang member that spawns in the kitchen facing the cooker as if he's helping out, perhaps community service or an alloted job from the Vice City Police Department, or simply just a pedestrian model. This individual gangster is not hostile to you in any way even after the collapse of the Haitians factory. 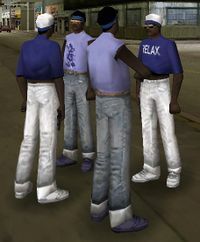 The baseball cap wearing variant of the Haitian gang member featured an ironed-on depiction of the infamous "I Want YOU for the U.S. Army" poster on his shirt during development of GTA Vice City before the game's developer settled on using a plain white "RELAX" text instead. If the player modifies the pedgrp.dat file to add both Haitians (Hna, Hnb) and Sharks (Sga, Sgb) to an area, the two gangs will be hostile towards each other, contradicting their affiliations. This page was last modified on 4 January 2015, at 08:22.